Little Victoria is five days old. She and mama Ruby have been stuck in the barn since last Sunday when she was born. Up to this point the weather has been yucky so the barn was a nice place to be, but today was an exceptionally glorious day - sunshine, no wind, warm temps (up to 50F). But poor Ruby and Victoria were still stuck in the barn, bored and cooped up, because we had not yet dehorned Victoria. We did so this evening. We shooed Ruby outside and pulled the calf into Matilda's pen (where there's an electric light as well as a power outlet for the clippers. Here Don is shaving her horn buds. It's easier to apply the dehorning paste directly on top the horn buds if a lot of that pretty curly fur is out of the way. 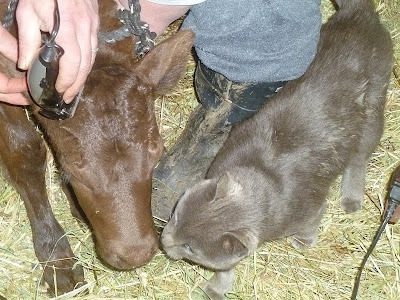 Our barn cat, JJ, decided this was a really good time to get really friendly with the new calf. Next I put two circles of Vaseline around the horn buds to corral the dehorning paste into the right location. This is what it should look like after the paste is on (including the calf's sulky expression). Next comes the fun part. The calf's head must be wrapped in duct tape to keep the dehorning paste from getting all over mama (either Ruby's tongue while licking her calf, or on her udder while the calf is nursing). 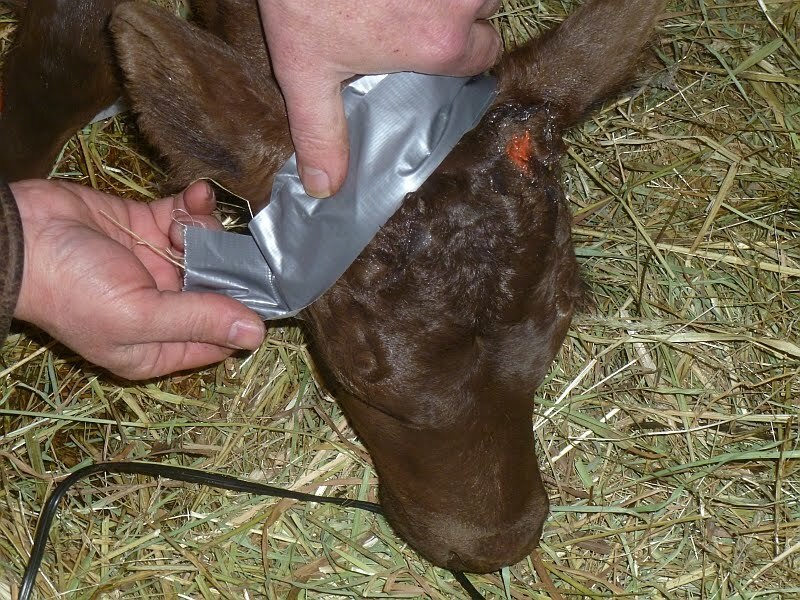 The tape must be wrapped in such a way that it doesn't cover the eyes or pin back the ears, and it can't be so tight it chokes the calf. 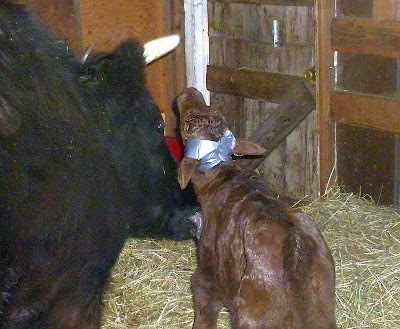 But it has to be on tight enough that it won't come off, either by sliding or when the mama licks the calf's head. Don is better at doing this than I am. Once again JJ was a big help. What is it about cats and their impeccable timing? 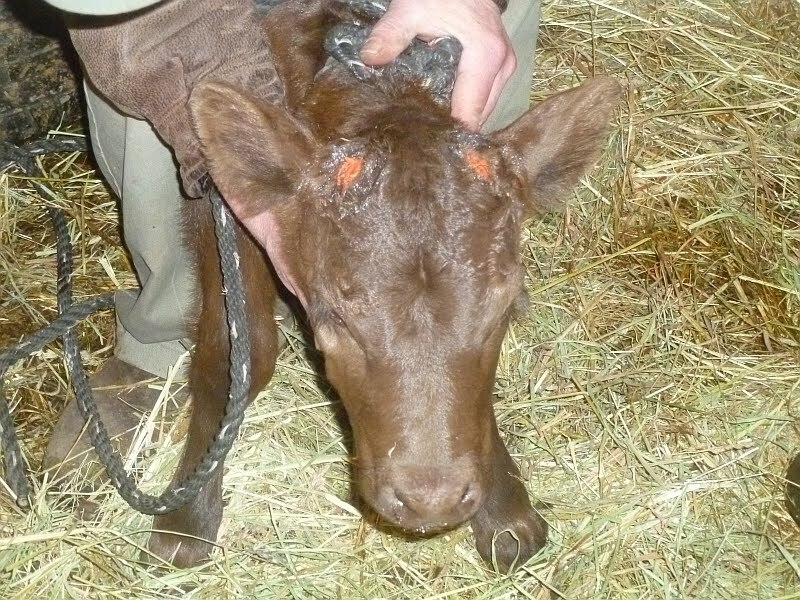 Calves hate having their head wrapped and will sulk mightily. The duct tape should stay on for 12 hours. If we dehorn in the morning, we remove the tape in the evening. Because we dehorned Victoria in the evening, we'll remove the tape tomorrow morning. See Ruby licking her baby? This is why that duct tape must be over the dehorning paste. It would be horrible for the paste to get on Ruby's tongue. If all this seems like an enormous hassle, compare it to the hassle (and expense!) 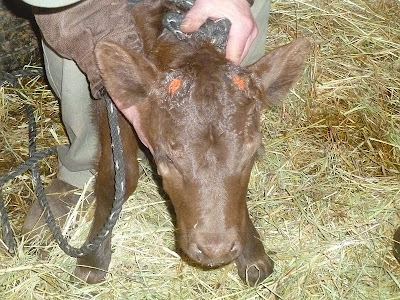 of a vet coming out to do a manual dehorning -- the blood, the cauterizing, the trauma. Believe me, dehorning paste (on young animals!) is the way to go. I'd read somewhere that dehorning paste is brutal, but this makes it look like a great option. I wonder, do you think it is very painful? We're looking into owning a cow, but for now I think we'll try and get a polled breed because I just don't trust myself to do any dehorning. So much nicer than other methods. I worked on a dairy farm that used to burn the nubs with an electric de-horning iron. Not kind. As much as I like the looks of horned cattle, I understand the reasons for their removal. Tell Ruby she is very pretty with her horns, but be careful with them. Thank you for sharing the paste applied method of dehorning in a pictorial sequence for us ! I have always used the cautery method, because I had heard some terrible unintended consequences of poisoning, blindness and chemical burns using paste. I will concede after seeing your presentation, and attempt the paste method this spring on our next calf. Once I use it, then I'll be better to make an honest critique of which was best for the calf and on us. Thank you again for all you do! Especially, in sharing your Simple footprints of living. Wow, yet another use for duct tape! Do you have to clean the paste and vaseline off once the tape is removed? If so, do you just use vinegar? Thanks! No. When we remove the tape after twelve hours, the Vaseline and paste have kind smeared and spread out about an inch across (since it was all squished down by the duct tape plus everything warms with the calf's body heat). This means the paste covers a wider area than just the horn buds, which is why the initial layer of paste needs to be THIN. But the Vaseline keeps the paste from spreading too far out. We don't clean off the paste because by then it's done its work and has been absorbed into the skin. 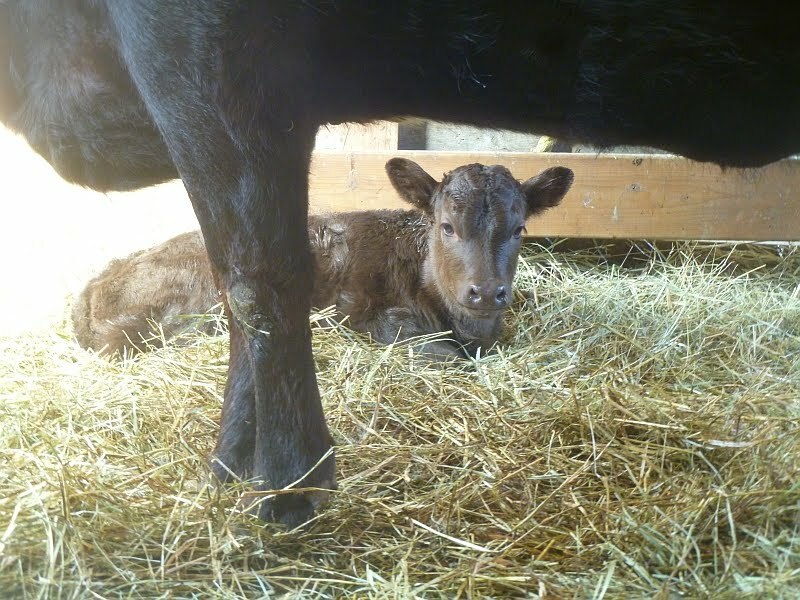 BTW, for those wondering about pain - if the behavior of the calf is anything to go by, the pain is minimal. The biggest discomfort appears to come from the duct tape itself. This morning we cut the tape off Victoria's head, and as of right now (3:50 pm) she's bouncing around, happy and cheerful. The cat and the calf interaction is very cute. I wonder if the cat helped Victoria feel a little less stressed? Lydia could learn a thing or two from JJ.